Then we adapted each session for you to use. Some of them require some precision and familiarity with terms like anaerobic threshold, but we’ve tried to explain these as we go, while one particular session is best done using a power meter. Finally, two have been included because they demonstrate two overriding training principles, specificity and addressing weaknesses. You can train with all the gadgets and numbers in the world, but unless the work you do is specific to the demands of your objective you are limiting your potential. The same goes for not improving your weak areas; identify and sort them out or they will undermine any result you are after. “A four-hour ride but with two big efforts on a long climb in the Peak District. I do the climb a lot and know my times on it. I look at my average watts and time on the climb to see how I’m going, but I don’t ride it at my threshold all the way. 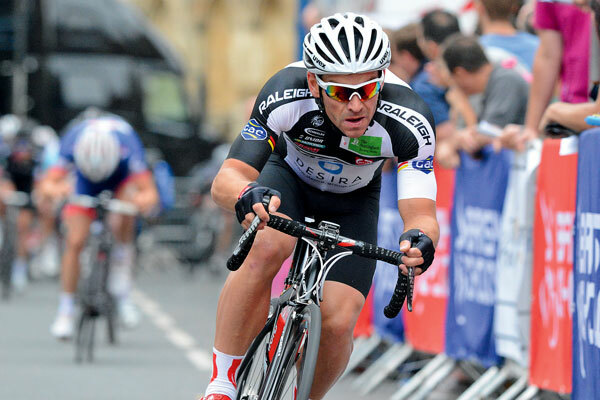 The threshold Stannard talks about is his anaerobic threshold, or the effort he can hold for one hour if he has to. It’s hard riding but sustainable, the maximum power a cyclist can produce aerobically. However, if this level of effort is exceeded for any length of time, processes in the body, which increased levels of lactate play a part in and is a marker of, cause it to slow down. Except, the thing is in a race sometimes you have to exceed this level, so racers must condition their bodies to meet that demand. This session does that. 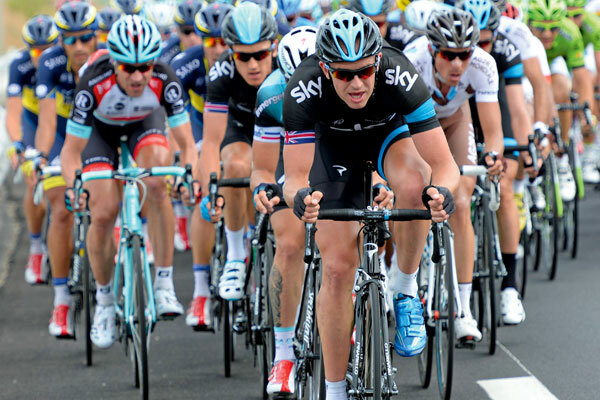 Under-over threshold training like Stannard does is very effective and is used by Team Sky a lot. Either riding like Stannard at just under threshold then over then back again, or riding just under threshold then simulating an attack, but when they back off the riders don’t ease off as you would in normal interval training, they keep riding just below threshold pace, because that’s what they have to do in a race. The team’s trainer Tim Kerrison calls the latter type of training ‘spiked efforts’. An attack coming when already riding at a high level creates a lot of lactate in the muscles, because the attack effort is anaerobic. But when the rider drops back to just under his threshold his body has to clear the lactate and recover while still maintaining a high pace. Chris Froome’s victory on Mont Ventoux in this year’s Tour de France was a perfect demonstration of this training in action. 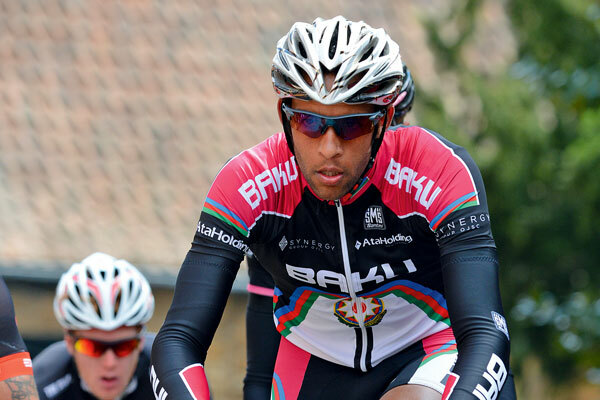 He was already riding close to threshold on the mountain when he attacked the group containing Alberto Contador. But then Froome went over his threshold to catch Nairo Quintana, but having done that Froome had to continue riding at close to threshold with the Colombian while clearing lactate from his muscles. ‘Under-over’ or ‘spiked efforts’ training helped him do that. Training like this will condition a road racer to make and sustain attacks. The ability to ride over threshold pace, then clear lactate while still riding hard is also useful for cyclo-sportive riders who want to get a good finish time, because it helps them make it into faster groups when splits occur along the route. This training is also good for time triallists, as modern thinking in time trials isn’t to ride the distance at constant effort, but to vary it around threshold, sometimes going over where the course demands, such as on climbs, and sometimes dropping under where the course allows, such as on descents. Be careful though. Team Sky riders only do it every other day, and even then only then only during big training blocks for specific races. And they are full-time pros with sophisticated back-up; once a week is enough for most. Use a turbo-trainer because you need to control the effort precisely. Alternatively this session works well on a long climb if you have one locally. The climb Stannard uses takes him about 13 minutes to ride. Warm up for 15 to 20 minutes, increasing your effort level throughout. Start the specific work by riding for five minutes at five per cent under your threshold then go over it by five per cent for one minute. Follow that with two minutes at five per cent under threshold and continue like this, going over and under, for up to 15 minutes. One of these intervals is enough until you get used to them. Complete the training session with some easy spinning. 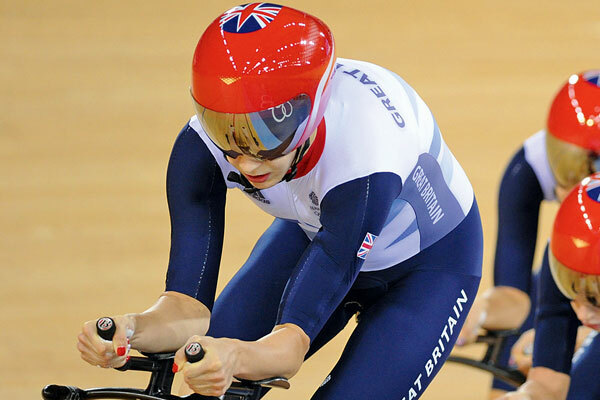 “A good session we often do as part of our team pursuit training is an interval session where we do 20 seconds on, 40 seconds off. We do this quite a lot in Majorca up the climbs so even in the 40 seconds off you still have to work a bit so you don’t come to a complete standstill! This is a good session for team pursuiting as it replicates the nature of the event, because the 40 seconds off are nowhere near completely off, so it’s like the team pursuit where you still have to get back on the line and ride quite hard after your turn. Like David Clarke’s (below), this session combines lots of things. The 20 seconds hard are a micro-interval, but the fact that they are done uphill so she has to make a reasonable effort during the 40 seconds is very specific to Rowsell’s Olympic event, the team pursuit. The session is another good one for building the neuro-muscular pathways required for perfect pedalling. And because the 20-second intense bits are anaerobic efforts it improves your body’s ability to process lactate while still riding hard. This is another session that should go into all road race, criterium, cyclo-cross and track race training programmes. It replicates some of the crucial demands of each of those events. It’s also a useful one if you are a sportive rider and you feel you lack power on steep hills. Find a hill it takes at least six minutes to climb when riding hard. Then after a 15 to 20-minute progressive warm-up, ride up the hill for five minutes broken into 20 seconds going as hard as you can and 40 seconds riding easier. Stop and rest to recover at the top then freewheel back down the same side and do it again up to four times in a session. “This session is very good if you are short of time. In fact if you did this four or five times a week you would get really fit. It’s best done on a turbo- trainer but you can do it on the road. What you do is ride for half an hour at just under your anaerobic threshold. This session combines two very effective forms of training; riding at an intensity called sweetspot, and short intervals that push up your maximum sustainable power output. Sweetspot is around five per cent under your anaerobic threshold as measured by heart rate or power output, and it’s an intensity you can ride at on a day-to-day basis. That’s because you aren’t pushing the red line where your body starts producing lactate, which is what you risk doing when training at your anaerobic threshold. Threshold training is effective and has its place, but sweetspot is nearly as effective at pushing up your threshold power and can be repeated often, so you do more total training. The other element, the one minute riding as hard as you can followed by two minutes easy, is a micro-interval and micro-intervals are great for building total power, for boosting VO2 max towards its genetic potential and for increasing efficiency. The intensity of micro-intervals requires you to pedal perfectly which in turn teaches perfect pedalling. It’s so effective that many riders use micro-intervals to get used to new riding positions. “The intervals are so hard your body has no position but to adapt,” says Chris Boardman, who used to train implementing micro-intervals as short as 10 seconds repeated every minute on a turbo-trainer for one hour. The sweetspot element will help push up your anaerobic threshold from below, while the one-minute intervals not only help you access more of your VO2 max, they will help raise your anaerobic threshold from above. All cyclists should do this one, no matter what their event. It addresses three performance factors, which underlines Clarke’s claim that you could realise a lot of your potential by doing little else but this session. Just copy Clarke’s session, but start by doing five of the one-minute hard in every three and build up to 10. “Something I start doing about one month before the Tour Series races is a two-hour ride that has some five-minute intervals in that are like the effort you have to make in a criterium. I do five of them and each one starts with a 30-second sprint. Criterium racers have to be explosive and they need a sprint that can come off a high pace when races get really intense at the end. This is a well thought-out session that addresses both of those demands. Even if you don’t specialise in circuit racing, most people’s first experience of road racing is on a closed road circuit, either an airfield or a purpose-built cycling circuit like the one at Hog Hill. Regardless of the overall ability and experience of the field, these races are always fast, and they always start especially fast. Sessions like this one of Briggs’s and the one below will help you cope with that. Find a circuit with four corners on flat, quiet roads of about one to two miles long. After a good 15-minute warm-up, sprint out of the first corner, keep the effort going when sat in the saddle along the straight then slow for the next corner and sprint out of that one. Keep the effort going to the next corner then repeat until you’ve sprinted out of all four corners. Then ride easy along the following straight and repeat the four-corner sprints another three times, with one straight ridden easy between each set of four corner sprints. This is a real circuit-race specific session. “This session is quite good on days when I’m not feeling very motivated or short of time, because it’s quite quick and there’s no time to think about anything other than the session and the clock. It also makes a nice change to most of my TT training which is more steady state stuff. I always feel good afterwards too, a nice little sharpener session. It’s a repetitions session, but the reps are so short it has to be done with a power meter or a turbo with power readout. “Warm up for about 15 minutes then set one is 12 minutes of doing 10 seconds at 150 to 200 watts above 10-mile time trial power alternated with 20 seconds riding very easy or complete rest. So that’s 24 efforts. Set two is eight minutes of 20 seconds at around 80 to 100 watts above 10-mile time trial power alternated with 10 seconds very easy or rest. This training session combines a lot of what the others do into one quick session. It’s perfect for doing on a turbo when the weather is bad outside because there is a lot to focus on changing effort length and rest time, so that will make time on the turbo pass quickly. It’s a great pep-up session that will put real zip into your legs. It will improve efficiency through having micro-interval elements, and it should have a positive effect on raising anaerobic threshold, VO2 max and the ability to clear lactate. This is a very effective training session for a time triallist who knows his or her average power outputs for different distances. Using the specified power outputs would ensure progression. It would also be useful for road, track and off-road racers who could do the hard bits as hard as they can. The 10-second intervals are great for building total power and efficiency through the micro-interval effect. The 20 and 40 seconds boost VO2 max and raise anaerobic threshold. Just copy Julia’s session directly. Time triallists would be best served by using power as a measure, provided they know their 10-mile performance average power output, but everybody else should go as hard as they can for the duration of each interval. Just remember to spread your effort equally through each interval and try to make the last one as intense as the first. Don’t put everything you’ve got into the first, spread your effort throughout the set instead.